SwiftyImage provides a simple way to create images with method chaining. Method chaining starts from UIImage.size() or UIImage.resizable(). You can set fill color, border attributes, corner radius, etc. Use .image at the end of method chaining to generate image. 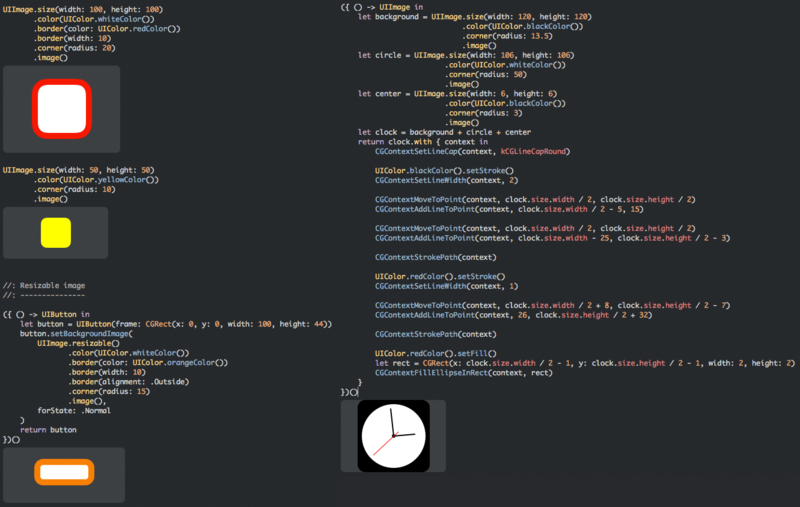 SwiftyImage also provides a simple method to create or manipulate images with CGContext. You can easily combine multiple images with + operator. Use CocoaPods command $ pod try SwiftyImage to try Playground! SwiftyImage is under MIT license. See the LICENSE file for more info.